In the end, as is so often the case in this space, it was about the deal. Chargers owner Dean Spanos spent 16 years searching for a stadium solution in San Diego. After a failed November referendum, he still didn’t have one. An 11th-hour proposal—with a potential $375 million from the city, county and San Diego State University—was presented that local politicians claimed left “only” a $175 million funding gap. But that public contribution was nothing more than theoretical. Of the total, $275 million needed approval by city and county voters, and the $100 million in higher-education money from San Diego State needed the approval of Governor Jerry Brown, a staunch opponent of public subsidies for stadiums. Thus, the real funding gap was $550 million ($1.2 billion for the proposed San Diego stadium construction cost minus the $650 million from the Chargers and the NFL). Though the deadline for the Chargers to join the Rams in Los Angeles was moved from Sunday to Tuesday, Spanos apparently didn’t need the extension. He was set to announce his teams’ plan to move to L.A. on Thursday morning. More than anything, my feeling is one of sadness for the fans of San Diego, as it was last year for the fans of St. Louis. With stadiums now costing billions and owners looking for the biggest revenue boost possible from these venues, fans are caught in the crossfire of negotiations between politicians and team owners, with both sides looking for personal and political gains. Knowing that everything is negotiable, I had thought there would still be a way for the Chargers to remain in San Diego, with Spanos truly not wanting to leave and thus willing to take a chance that a future solution would emerge. Perhaps, I thought, Rams owner Stan Kroenke would want the L.A. market all to himself and he and/or the NFL would step up and close the San Diego gap. This option would have still faced opposition, however, with some owners believing Spanos had no right to ask for more than the unprecedented $300 million that had already been offered. 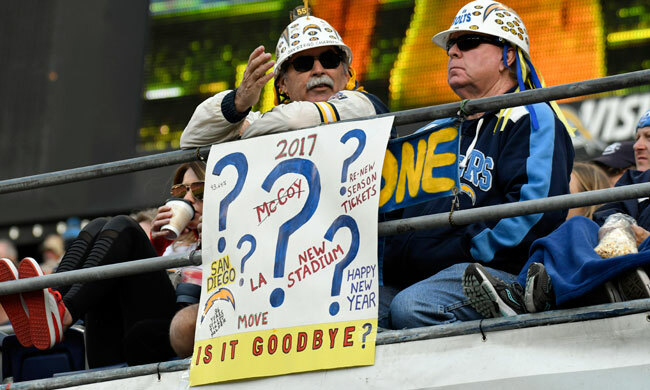 That turned out to be wishful thinking for the fans of San Diego, as the ship appears to be sailing north to L.A. Now, after Spanos finished second in the three-team race for L.A. a year ago, he and Kroenke—owners who literally staked out different corners of the lobby and gave each other sideways looks in their race for L.A. last year—appear to be partnering in an unlikely union. The benefit for Spanos is obvious: He is not responsible for the design or construction of a new stadium; he doesn't have to worry about cost overruns, etc. He has a nice share of revenues along with a huge increase in franchise value (more than accounting for the $550 million relocation fee). Beyond his sentimental feelings toward his San Diego home, he is getting a good deal; so good that there was some concern that the Raiders might take it if they didn’t. Speaking of the Raiders, they haven’t worried about showing loyalty to their home market; they’re now “engaged” with Las Vegas (no word on whether they’ll get married in one of those little chapels). They have a striking $750 million stadium deal in Las Vegas, and an apparent smoothing of a relationship with casino magnate Sheldon Adelson; owner Mark Davis is expected to file for relocation with the NFL for the second consecutive year (he has not filed yet; the deadline is Feb. 15). Wednesday’s meeting of the powerful NFL Stadium and Finance Committee members was primarily about the Raiders. Back in November, a similar set of meetings featured senior NFL executives throwing cold water on the Las Vegas market as one that may not be sustainable due to its size (interestingly, gambling was not discussed). That did not please the Raiders or Adelson, who is free to walk away at any time. Some owners were upset about those characterizations; these meetings are now designed to make up for that meeting and give a more balanced view of Vegas. I would expect another league meeting to be scheduled about the Raiders and Las Vegas, culminating in a potential vote by the annual owners’ meeting in March. We may well be on the way to seeing the three teams in play at this time last year—the Rams, Chargers and Raiders—all relocating in the space of a year. The business of football is moving at a faster pace every year. I was involved in a couple of coaching hires in Green Bay. Our interview process was very personnel-driven to make sure the coach would buy into our “draft and develop” philosophy. We allowed candidates a wide berth to talk about their visions, their goals and themselves. We were trying to project that this person would not point fingers if things went south. We have seen that in a few situations around the league already this year (ahem, Buffalo) where ownership has had to make a choice. As I did with player interviews, I would ask the coach questions off-script (agents coach up coaches, just like they prepare players). For example, I would ask about past failures, if there were players that would not say good things about them, etc. I would also ask about fitness routines and outside interests, trying to gain insights into characteristics I think are important to success: self-motivation, self-discipline and life-work balance. Our decision came down to two highly skilled and talented offensive minds, Mike McCarthy and Sean Payton. It was fascinating hearing them discuss offensive philosophies, a true master class in working the “perimeter” and “boundary.” Ultimately, a key factor tipping the scales toward McCarthy was familiarity; he had worked with us as part of Ray Rhodes’ staff years earlier. One recent hiring trend does not appear to be in vogue this year as much as recent years: the use of executive search firms. While these firms give owners 1) a sense of security that the boxes have been checked and 2) “cover” if the hiring doesn’t work (blame the search firm), there is significant cost. I have heard of firms charging 30% of the coach’s first year salary (on a $5 million salary, that is $1.5 million). Teams like the 49ers and Browns are paying tens of millions of dollars to fired coaches and executives in their repeated efforts to “get it right” in the hiring process. These are cautionary tales for teams to choose wisely in this interview period. As I note every year, the difference between player compensation in the regular season and postseason—where games are much more important—is counterintuitive, with the most important games paying the least. NFL player contracts are irrelevant in the playoffs; postseason pay (from the league, not teams) is the same for every player. These are the cumulative per-player payouts this year. Teams earning a bye week—Falcons, Cowboys, Chiefs and Patriots—were technically not paid for that week of practice. Practice squad players make their contracted amounts every week their team is playing. A stark example of the contrast is Brock Osweiler, who made $21 million this season, averaging out to $1.235 million a week. For last week and this week’s much more important playoff games, he makes $27,000 per game, barely 2% of his regular-season weekly amount. The incongruity of postseason pay has always been one of those “well, that’s how it’s always been done” aspects of NFL player finance. For any other business, it is illogical to better compensate the most mundane achievements compared to the most important ones. I’m not encouraging it, but imagine the leverage a star player or group of players would have if they threatened to boycott a playoff game, when their economic risk would be nominal? I know, playoffs are about legacy, not money, but we would be naive to believe all players would choose a chance for glory over being paid at least to the rate of their contract. This postseason advantage of owners over players continues to exist with no end in sight.